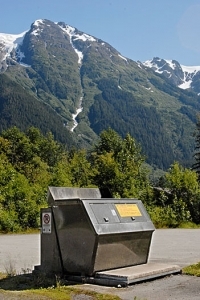 The Town of Canmore, Alberta stopped curbside collection of residential trash containers altogether in 1999 and replaced that system with neighborhood communal bear-resistant dumpsters. In doing so, they went from over 300 bear incidents and four bears being put down in 1998 to few sightings and no real problems involving bears and trash. They also cut the town’s trash pick-up costs by 44%, saving taxpayers over $160,000 a year. Read more about the Canmore Experience.